TT Pro League table-toppers Defence Force and Bankers Insurance Central FC missed the opportunity to extend their advantage at the top of the 2015/16 standings last night, as they both succumbed to 1-nil defeats at the Hasely Crawford Stadium. Photo: San Juan Jabloteh attacker Tyrone Charles (right) keeps the ball from Central FC right back Kaydion Gabriel during 2015 Pro League action last night at the Hasely Crawford Stadium. 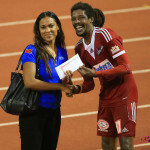 Charles scored the only goal in a 1-0 win for Jabloteh. 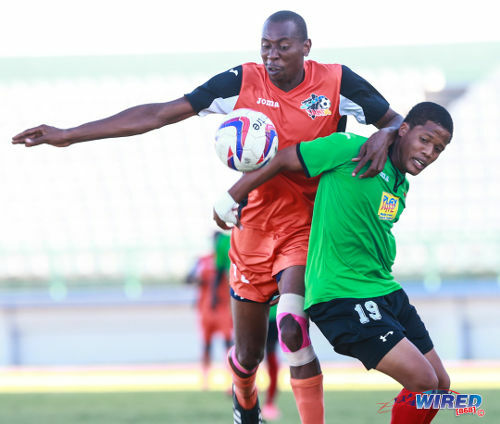 The Army/Coast Guard combination fell prey to their law enforcement counterparts, Police FC, while Central were beaten by a resolute and aggressive Play Whe San Juan Jabloteh outfit. 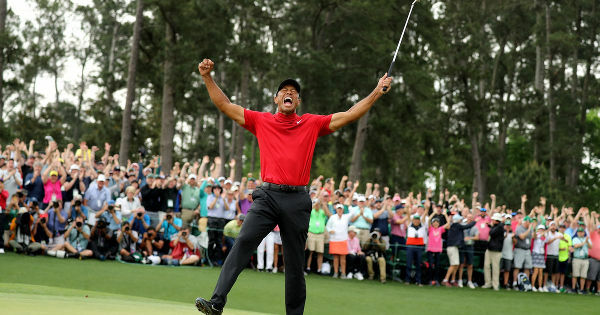 Both teams also suffered their first defeats of the season in the process, which leaves First Citizen’s Bank and Toyota Classic Cup winners DIRECTV W Connection as the only unbeaten team in the current Pro League season. Army and Central still sit atop the Pro League standings with eleven points apiece though, with the “Couva Sharks” only trailing by an inferior goal difference. 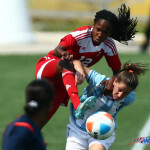 It was just two days ago that Defence Force walloped Point Fortin Civic FC by a 5-1 margin at the same Port-of-Spain venue. But last night coach Marvin Gordon’s troops were not as deadly with their artillery. They instead traded misfired shots with Police for most of the 90 minutes before Makesi Lewis notched his league-leading sixth goal of the season to settle the affair in the 70th minute. 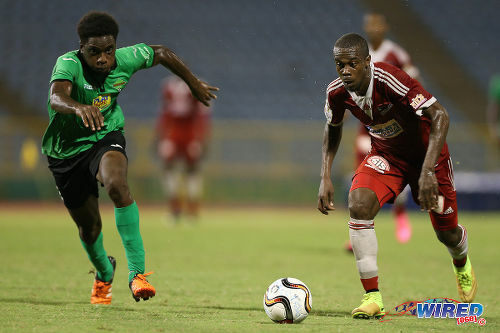 Photo: Central FC attacker Marcus Joseph (right) tries to accelerate past San Juan Jabloteh defender Garth Thomas during 2015 Pro League action last night at the Hasely Crawford Stadium. While things have been going smoothly for Lewis and his attacking teammate Kareem Freitas, who has five league goals thus far this season, the Pro League’s all-time leading scorer, Devorn Jorsling, has been having a much bumpier ride. Jorsling, who was sent off in his team’s 4-0 Toyota Classic final defeat to W Connection on Sunday, found the odds and the football gods stacked against him once more last night, as he struck the woodwork on either side of the half. The burly striker could have opened the scoring mere seconds into the contest but saw his right-footed effort crash off the post after he evaded Police goalkeeper Adrian Foncette. Jorsling’s early miss seemed to set the tone as both teams failed to make the most of their opportunities during the first half. Defence Force captain Jerwyn Balthazar had the two best bites at glory near the half hour mark but he got both efforts horribly wrong. First, in the 29th minute, the Army skipper scuffed his long range shot after Foncette sent a dreadful pass straight into his path. Then, mere seconds later, he skied a first time effort overbar from the edge of the area, after a smart cut-back by winger Kishun Seecharan. Photo: Defence Force winger Jelani Felix (right) cuts inside a Police FC opponent while his coach Marvin Gordon looks on during 2015 Pro League action last night at the Hasely Crawford Stadium. 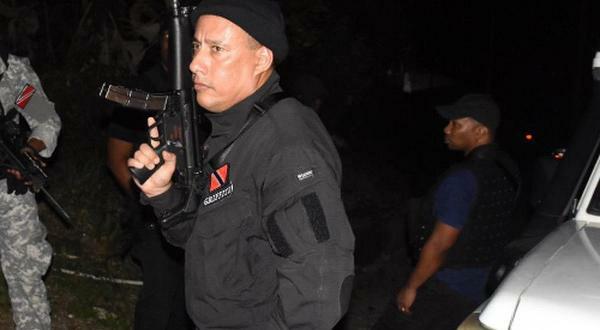 Police attacker Christon Thomas was making some noise of his own at the other end. He somehow managed to trick his way past Ross Russell Jr with a mazy dribble down the right flank in the 38th minute but Lewis’ subsequent deft volley just sailed overbar. Gordon’s charges came out with a rejuvenated effort at the start of the second half and sent waves of attack in Foncette’s direction. The Police shot-stopper punched away Dave Long’s firm, long range drive in the 50th minute before stopping a dipping 25-yard free kick by Jorsling, six minutes later. Army were having shooting practice and Foncette’s goal-netting was the elusive target. On the hour mark, Foncette showed that his hands were not his only saving tools, as he sprawled out his frame to stop a Kerry Joseph strike with his right leg. 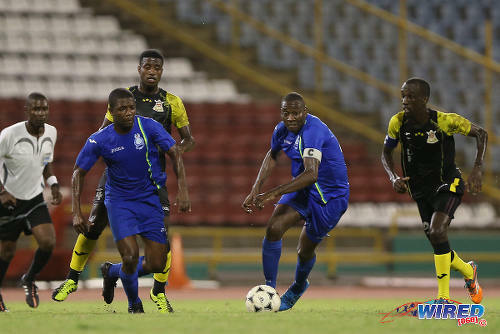 Photo: Police FC captain Todd Ryan (second from right) drives forward with the ball while his teammate Kaaron Foster (second from left), Defence Force captain Jerwyn Balthazar (right) and referee Keon Yorke (far left) look on during 2015 Pro League action last night at the Hasely Crawford Stadium. When was the Army breakthrough going to come? The resounding answer was there for all to see in the 67th minute when another Jorsling free kick—from almost the same spot as his first—swerved and struck the base of the upright with Foncette a beaten man. 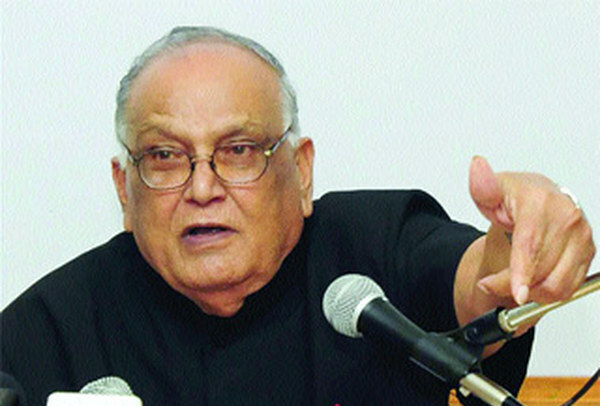 In this cruel game, a team which fails to make the best of its chances is penalised nearly every time. And the spirited Lewis was the one to deliver the punishment last night, as he buried a left-footed shot from close range after Thomas swivelled past defender Marvin Jones on the flank and served up a deadly cut back. Lewis’ item knocked the rhythm out of Defence Force’s game and they struggled to create any clear opportunities thereafter. 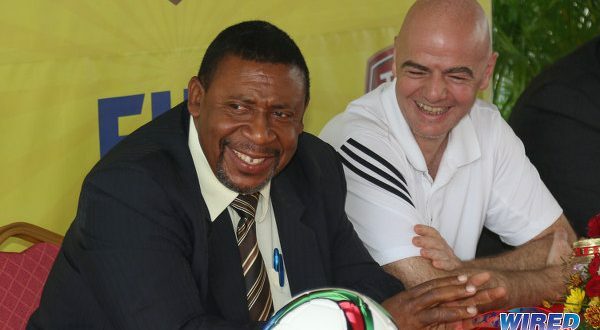 However, Jones did try to force referee Keon Yorke’s hand with a penalty appeal in the 85th minute, after breezing by a couple Police players before running into Karlon Murray. Yorke was having none of it, though. Jones received a yellow card for his loud appeals as he sat in the penalty box. And that was swiftly followed by red, after he continued to mouth off. 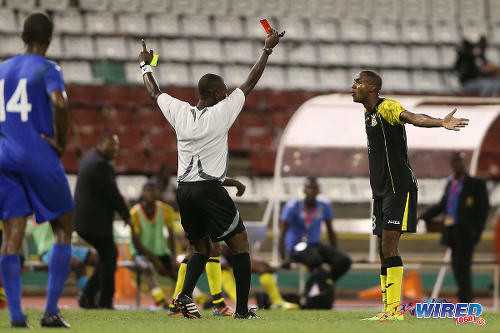 Photo: Referee Keon Yorke (centre) flashes a red card at Defence Force right back Marvin Jones (right) while his coach Marvin Gordon (second from left) looks on during 2015 Pro League action last night at the Hasely Crawford Stadium. 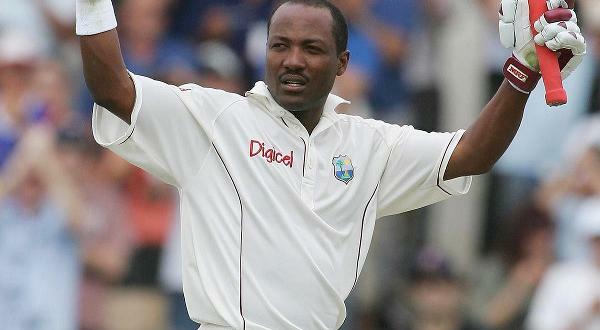 Clearly Jones had not learnt from Jorsling’s dismissal in the Toyota Classic final last Sunday. Lewis had the chance to add a touch of gloss to the score line in the 89th minute but Army goalie Sheldon Clarke’s sharp, low save ensured that the final score line read 1-0. 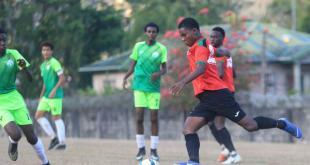 While Defence Force found Foncette to be in an inspired mood, defending Pro League champs Central FC found all 10 Jabloteh outfield players just as motivated. 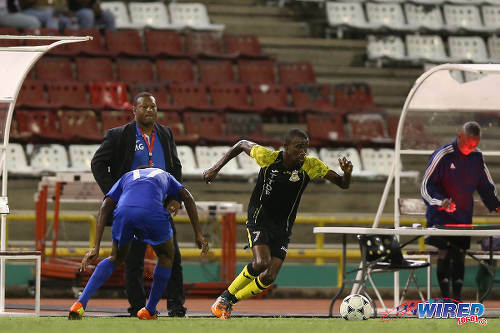 And former Central employee, Tyrone Charles, demonstrated his keenness in the 66th minute, as he wrestled off right-back Kaydion Gabriel before cushioning a left-footed shot past stranded Central custodian Jan-Michael Williams to register the only goal of the game. Sharks were not their usual fluent selves and could not find their bite in attack last night, as Jabloteh’s central midfield trio of Keyon Edwards, Jevon Morris and skipper Damian Williams bullied and largely nullified the Central duo of attacking midfielders, Ataulla Guerra and Marcus Joseph. 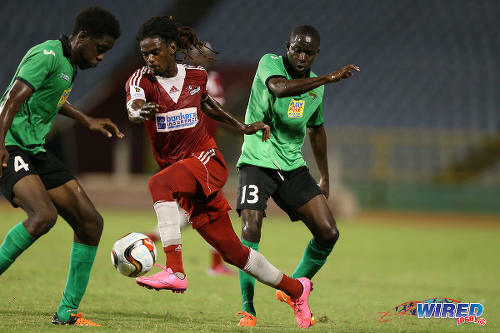 Photo: Central FC winger Jason Marcano (centre) tries to find a way past San Juan Jabloteh players Fabian Reid (right) and Garth Thomas during 2015 Pro League action last night at the Hasely Crawford Stadium. And Central’s lethal marksman, Willis Plaza, got little space to breathe as opposing defenders Aquil Selby and Adrian Reid kept his company for most of the night. Central got more ball possession in the second half but Jabloteh’s defence grew increasingly defiant after Charles’ effort. And, in the end, skied snap shots by Plaza and substitute Kerry Baptiste were as close the Sharks got to tasting blood. 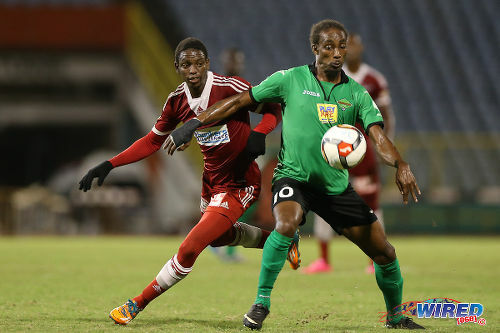 Jabloteh and Police’s victories saw them leapfrog the undefeated Connection to fourth and fifth spots respectively. 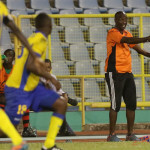 Connection will seek to continue their fine form today when they tackle seventh placed St Ann’s Rangers at the Ato Boldon Stadium from 6 pm, while cellar-placed Club Sando search for their first win of the season from 4 pm when they tackle fellow southerners Point Fortin Civic at the same Couva venue. Morvant Caledonia United will also go in search of their first league win when they meet third placed North East Stars at the Larry Gomes Stadium from 3.30 pm. Police FC (3-4-2-1): 1.Adrian Foncette (GK); 4.Karlon Murray, 20.Elijah Belgrave, 2.Jasimar Ashers; 6.Jibri Mc David (8.Kurdell Brathwaite 90), 21.Todd Ryan (captain), 14.Kaaron Foster, 17.Nequan Caruth (12.Kevin Lewis 73); 19.Christon Thomas, 10.Kareem Freitas (16.Keon Wilson 80); 9.Makesi Lewis. Unused Substitutes: 22.Keinol Paul (GK), 13.Ricardo Peltier, 15.Jameel Perry, 16.Keon Wilson, 18.Dylon King. Defence Force (4-2-3-1): 25.Sheldon Clarke (GK); 13.Marvin Jones, 8.Curtis Gonzales, 6.Rodell Elcock, 12.Ross Russell Jr; 4.Dave Long, 99.Jerwyn Balthazar (captain); 30.Kishun Seecharan (16.Kellon Serette 76), 23.Kerry Joseph (52.Stephan Campbell 86), 12.Jemel Sebro (7.Jelani Felix 32); 9.Devorn Jorsling. Unused Substitutes: 80.Aaron Enil (GK), 2.Glynn Franklyn, 18.Sean Narcis, 21.Akile Edwards. 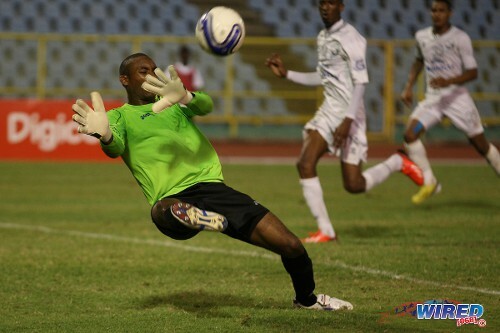 Photo: Police FC goalkeeper Adrian Foncette makes a point blank save from W Connection left back Kurt Frederick (not in photo) during 2013/14 Pro League action. Photo: Club Sando striker Kevon Woodley (left) battles for the ball with San Juan Jabloteh defender Dillon Kirton during the 2015 TTFA FA Trophy quarterfinal in Malabar. Think I will have to go with last week’s Chabeth. But in both instances the players were shown straight reds after saying something to the refs. So I can only assume what was said atm. Roneil K Walcott, which red card was more deserving… last night’s or last week’s? Player for player, Central has the best team in the country. So they cannot be counted out. I know your support is strong.